How cute is that purple satin ruffle skirt - and it is only $51! Great deal. If you can believe it, I still think about that striped sweater - a year later - and wish I would have bought it. 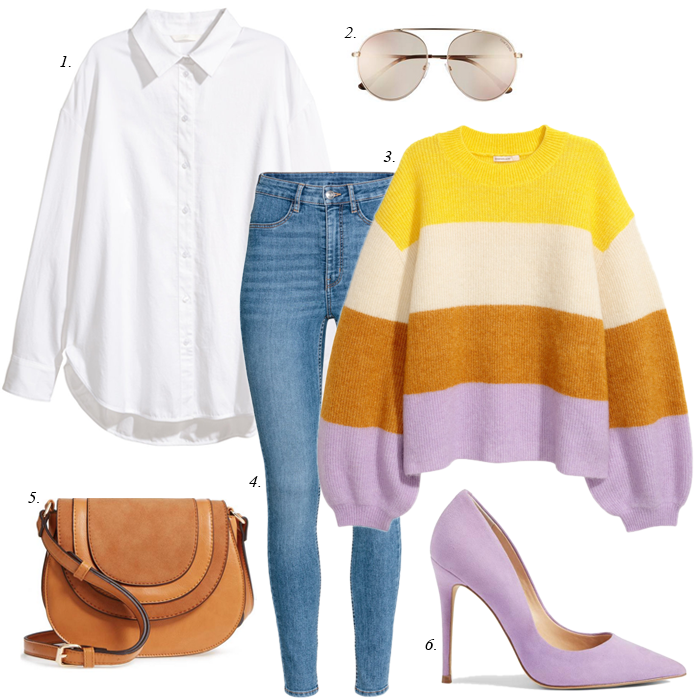 I featured that sweater in this blog post - and really liked the sweater since yellow is one of my favorite colors, and then never bought it. And, it was a really great price! That is probably why it sold out so fast. Anyway, it is kind of like life. What do we sit on and never take action on and then regret later? As far as the sweater, it was not fear that kept me from buying it - it was more a clothing budget concern - and not really needing it, just wanting it. But in life, a lot of times (probably many times) fear keeps us from accomplishing our goals. Rather we stay comfortable where we are. So, yesterday I made calls, got my tires ordered and my new ones are on their way! It is something simple like that task that might have kept me wondering what to do for weeks (by just putting if off), but I finally took care of it! So, my challenge to you - if you are like me - and become overwhelmed by even the smallest things - just start tackling "what you fear" one by one. And, you will get things done, and feel better. Trust me! This leopard tote is 33% off. This mini leopard bag is 50% off. This plaid scarf is on sale for 50% off. I like this leopard spot sweater for 60% off. This classic boiled wool coat is 60% off. I like this new arrival leopard sweatshirt. These tall suede boots are on sale for 60% off. These ankle booties are 50% off. This is a flattering striped tee with cute sleeves. This “heart” sweater is 40% off - and looks really cute styled. I cannot believe the price of this 50 piece lipstick set and it’s on sale. This LBD dress (also in pink) is on sale for $37. I like this tartan plaid scarf. All the pretty spring colors are so nice to see! I am not ready for it just yet but I love all the colors!